Using the celebrated edition of Thucydides by Robert B. Strassler, the principal and most dramatic events of the war are divided into fifteen tracks, chronologically ordered, covering the full extent of the conflict. Each track develops the story in two ways. First come the words of Thucydides and Xenophon themselves, poignantly narrated alongside musical backing by renowned Austin actor and director, Ken Webster. Second, cutting through the narrative, is Charlie Roadman’s own interpretation of the events, put to lyrics, and often telling the stories of those who do not find a voice in Thucydides’s text: onlookers, combatants, hapless victims of the battles. 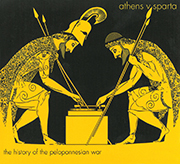 Like the primary sources, the musical version of the Peloponnesian War covers not only those moments of confrontation between the two sides, but also reflects the rich detail of the period: life in Athens, relationships between allies, the open sea, diplomatic encounters, and the historical reputation of the principal characters in Thucydides's work, from Pericles to Alcibiades. All in all, each song, with great pathos, relates the essence of this deep and drawn-out conflict and the ancient texts that told it, attracting newcomers, history enthusiasts, and music fans alike.